At the Solbjerg nursing home, new digital solutions have freed up more time for employees to spend with the residents, and this is just the first phase in a digital revolution. In ten years from now, all of the home’s offices will be gone, predicts the nursing home’s coordinator. It used to take Jette Hejlskov a lot of time every day to get an overview over what needed to be done at the Solbjerg nursing home in Aarhus, Denmark’s second city. Since the summer, however, much of the daily planning and communication has been carried out digitally, and it has freed up a lot of time, she says. 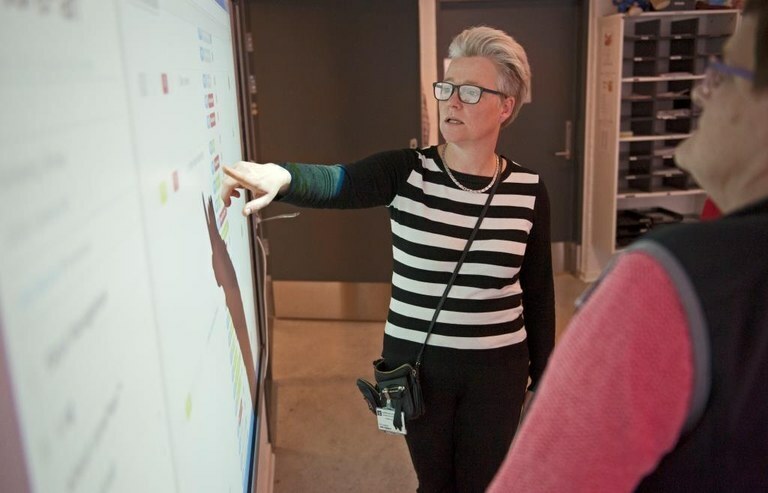 “Our new digital planning and communication platform has really been a bonus both for employees, residents and relatives,” says Jette Hejlskov. The new digital solution – EG Sensum carePlan – creates a better overview and strengthens communication both among staff and between staff and the residents and their relatives. Jette Hejlskov can now easily plan and change rotas and move tasks between employees. EG Sensum carePlan also makes it easier for the 40 residents and their relatives to find out what is going on. They can find out about meals and the day's activities via tablets which the residents have been given. 90 year-old Tove Inge Jensen is happy about this. “You just stroke your finger here, and you get a meal planner, activities and news. There is quite a lot of useful stuff here if you can figure out how to use it. It is nice to be able to keep track of developments, and you do when you get into this,” she says. Residents and their relatives can also use a large digital information board which hangs in the administrative unit near the nursing home entrance. It shows who is working and what activities are going on. It also gives Jette Hejlskov a useful visual overview over the more than 40 employees and students and the many tasks they are busy solving for the residents. Many employees in the public health sector feel they spend too much time on patient journals and other documentation. It ties them to a computer away from their core job of spending time with the people they are caring for. This is also the case at the Solbjerg nursing home, but Jette Hejlskov reckons the answer is digitalisation. “We spend a lot of time on the computer to keep the residents’ journals up to date. We would much rather spend that time together with them, and this is where digitalisation can help a lot. Our new system allows us to access journals via a tablet, while we are still together with the residents,” she says. Many of her colleagues are not experienced IT users, and some of them were not sure whether they would be able to use the new system. But that was all laid to rest and very quickly replaced by excitement, explains Jette Hejlskov. Neither has there been any concern among employees or union representatives over the fact that the system allows staff to follow what others are doing in detail. The system has a built-in log which shows when and for how long an individual employee has been in a certain place. But no staff have expressed concern that they were being observed, and when the union representative got a demonstration the reaction was that this should be introduced everywhere, says Jette Hejlskov. 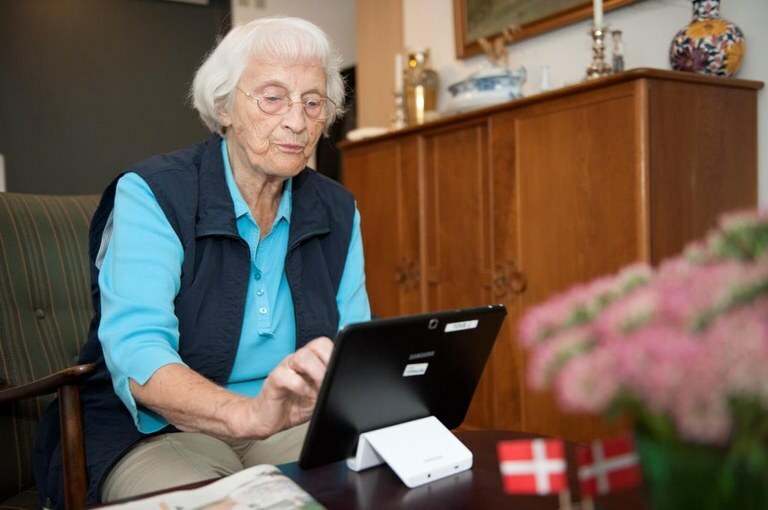 She is convinced that the digitalisation will result in much improved welfare – both at the Solbjerg nursing home and in the public sector in general. “Digitalisation is here to stay, and we have only seen the start of it. This is really a way of freeing up warm hands which can provide even better care,” she says. A modern communication, structure and planning platform developed to improve life for residents, optimise workflow for staff and improve communication between residents, staff and relatives. The platform is part of a future geriatric care system which the producer EG is developing for the municipal care sector. The solution is about to be rolled out as a pilot with a major care provider in Sweden.